These rolls are so fluffy and soft. You can start the dough up to three days ahead of time, so they are perfect for your holiday table! 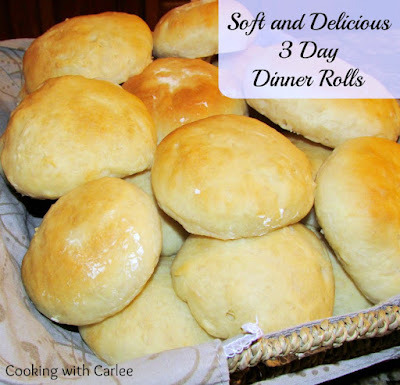 These rolls are so soft and really are easy to make! I have been looking for the perfect opportunity to share them with you and this seemed like the right time. They are a perfect roll for your holiday spread. You can size them smaller for your Thanksgiving or Christmas dinner, or larger for leftover ham and turkey sandwiches! Be warned though, if you make them this holiday season, you might as well plan on making them for every holiday from now on. People will love them so much they will keep requesting them! One of the best parts about these rolls is that you can make the dough up to three days in advance. You let them rise slowly in the refrigerator. So all you have to do the day of is a quick knead, shape them and let them rise. When you pull your turkey out to rest, put in the rolls. In 10-15 minutes you have fresh rolls! MiMi got this recipe from the ladies at her old country church. She volunteered to help prepare them for a chicken dinner at the parish and the ladies showed her how it was done. There is nothing quite like learning how to make homemade breads from people who have made thousands before! We have been using this method ever since. It seems counter-intuitive, but you really do want to add some flour at this stage. It makes them lighter and fluffier. All you have to do is keep folding the outer edges into the middle until you have a nice ball of dough with a smooth exterior. Though the name of the rolls are three-day rolls, don't worry you can make them in one! I suggest you make some today! Whip up a quick batch of orange cranberry butter to go on them and you will really quite a treat! In a large mixing bowl, dissolve yeast in warm water. Make sure the water isn't too hot! Stir in butter, sugar, eggs and salt until well mixed. Add two cups of flour, beat until smooth. Slowly add flour until you have added enough to form a soft dough. Do not knead! Grease a large bowl and place dough inside. Cover and refrigerate for at least and hour, but up to three days. The day you plan to bake them, remove from refrigerator and place onto a well floured surface. Knead until smooth and elastic, about 7 minutes. Divide dough into 36-48 pieces depending on the size roll you'd like (remember they still have to rise, so make the pieces smaller than you want your finished product.) On a floured surface, shape into balls by folding the edges into the center until you have a round shape that is smooth on the top. Place on greased baking sheets and cover with towels. Allow to rise until nearly doubled in size, about an hour. Bake at 375 F for 10-15 minutes. Immediately remove from baking sheets and place on wire racks to cool. I'm a carb fan too! Matt and I always love to throw a "Thanksgiving" for just us (and now Jax) in January or February. That way we have plenty of leftover turkey for sandwiches. These rolls make excellent turkey sandwiches!! I love a dinner roll and the sound of turkey sandwiches in your reply above has my mouth watering. Thanks Carlee for linking up with us at #WednesdaysWisdom. There is nothing better than a turkey sandwich with leftover roast turkey and fresh bread! Thanks so much for hosting and for stopping by! I love dinner rolls and these look so good! :-) Love that you shared this on MMM! You are the best! Thanks so much, Cathy! You seem to have dropped off my bloglovin' feed when you made your big move. I am glad I remembered to come see what you have been up to! These look great Carlee. I love love love yeast rolls. This recipe sounds yummy. I might have to break out the yeast this weekend. Thanks for sharing with us at Throwback Thursday. Thanks Quinn! Homemade bread is the best. It takes a little time, but it is worth it! The rolls look so good. I used to make all my own bread and rolls for many years. I don't do much of that these days and your rolls make me feel like making some. Thanks for bringing home made rolls to the party. Homemade bread is sooo good! I go through phases myself. i wish I made it homemade a lot more often. Maybe now that we are headed into winter, it will be a good way to pass the cold dark evenings! Thanks so much for hosting such a wonderful party! I am kicking myself for not signing up to bring the rolls for Thanksgiving dinner now! I will definitely be trying these for Christmas! I hope you love them!! I plan on forming up a batch while watching Macy's parade! I can't wait! Wow, these rolls look so good, soft and delicious indeed! Thanks for sharing at What'd You Do This Weekend?! They sound delicious - Thanks for linking up to Pin Worthy Wednesday, I have pinned your post to the Pin Worthy Wednesday Pinterest Board. I love fresh rolls, although I can't seem to make anything with yeast. Seriously. So sad. Thank you for linking up to Tips and Tricks. Pinning this. Hope to see you again this week. Oh man! Those little yeast can be finicky. It is hard to walk the fine line between water that is warm enough and water that is too hot and not too much salt for the yeast but enough that the product tastes good. These rolls are pretty forgiving. You can start with cooler water because the first rise is a long one in the fridge. Maybe they're worth a shot! These rolls look so yummy I wish I had a new refrigerator with more room! I'll have to try these when I get our new one. Me too! It is amazing how quickly a fridge can fill up! Hi! Thanks for linking up to last week's Tasty Tuesday linky! I have pinned your recipe to the Creative K's Tasty Tuesday Pinterest board. I hope you'll join us again tomorrow! Yes. Because ALL the carbs! 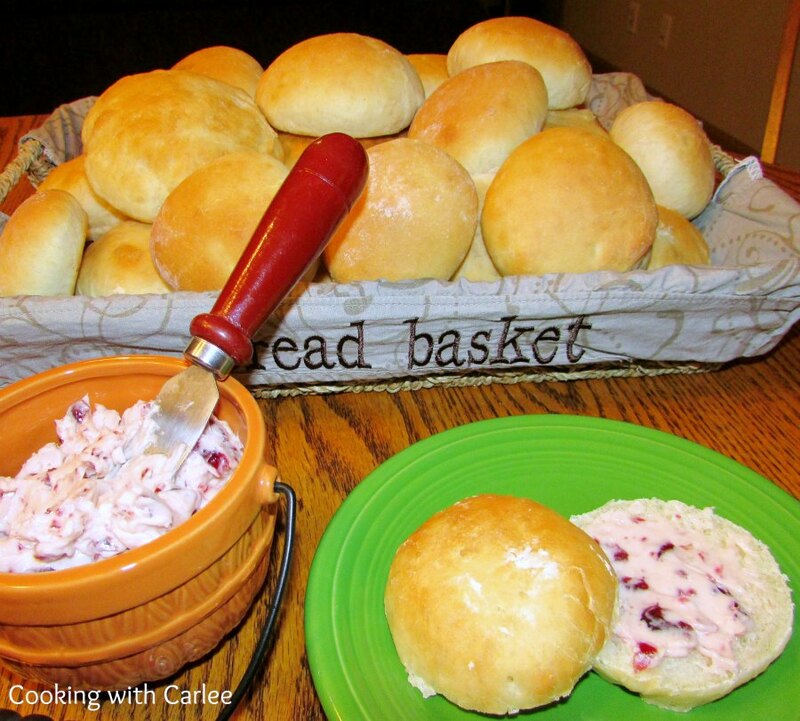 Thanks for bringing this awesome dinner roll recipe to last week's Throwback Thursday link party. Carbaholics unite! Thanks for stopping by! Oh Yum!! I've been needing a great roll recipe...looks like I found it! I hope you enjoy it! It makes quite a few and is really easy to do! These look so good! Fresh made rolls for Thanksgiving would be wonderful. I've always thought they would be difficult to make. Thanks for sharing at Snickerdoodle Sunday. They really aren't hard at all,the biggest problem is finding the oven space ;-) Thanks for hosting! I love bread, these rolls will be delicious. Thanks so much for sharing with Full Plate Thursday and have a great day. Me too, fresh bread is the BEST! Thanks so much for hosting, Miz Helen! These look great and easy! Thanks for sharing at the Lazy Gastronome's Whats for Dinner linky party! They really are easy and delicious! Thanks so much for hosting! I made these for Thanksgiving and Christmas, my family instantly said, "Whatever you do, NEVER, make anything else. These were awesome! Thanks for the post. I'm always looking for "quick" and yummy roll recipes to try. Pinned. Thank you! These are so soft and delicious, a family favorite for sure! These look like the perfect roll! Love they can be started in advance. Thank you! They turn out so soft and fluffy too!